The XK Detect X380 is a mid-sized quadcopter that is very easy to use. This drone offers a strong body and a battery that lasts for an extended period of time. It also allows you to set up your own camera so you can capture anything from high up in the air. If you want to know really top long range drones, you should check this list out. Note: The XK Detect X380 is an RTF or Ready-to-Fly drone, which means that you only need to charge up the battery before you can start using it. Its battery will run for about thirty minutes before it has to be recharged. Also, this quadcopter does not come with any cameras. This means that you will need to supply your own lightweight HD camera to be fixed to the bottom of the drone. Both, drone’s and transmitter’s build quality is surprisingly good. The drone has a study body that features an ABS frame and a nice carbon style painting that makes it look a bit different from other 350mm sized quads. The X380 also has a powerful receiver. This transmitter will take in signals with ease without worrying about interference getting in the way. The XK Detect X380 is designed for those who want to find a drone that will last for a while before it has to be charged up. This is also perfect for those who want a larger drone that is easy to fly out in public. If you want even larger drones – check this list of largest drones on the market. X380-C – GoPro alike camera (HD camera) with 2 axis brushless gimbal. You can buy the standard version if you already have some compatible action camera and a cheap 2D Gimbal. The drone comes with pre installed landing legs. However, you will have to install the propellers in order to make your first fly. Both the arms and the blades of the X380 are marked with the correct order of the propeller installation (the red color props are for the black and white ones for the front). The battery is loaded from the front and it must be charged up so the drone will work properly. To charge the battery up, you can use the battery charger or a USB cable. There are 4 screw holes on the belly of the drone. They serve to secure the camera mount or brushless gimbal to the quad. There is also a small wrench included in the package. It serves to help you with removing and fastening the blades if necessary. The XK Detect X380 has a wingspan of 376mm and it is about average in size. The drone weighs in at 950 grams, which means that the Detect X380 is also above average in weight. This drone is not that heavy, but these are one of the heaviest drones that can carry big payload. The quad is made with an ABS plastic body. This material has a very high melting point, which means that you won’t have to worry about the body warping or wearing out because of any heat that may be generated by the battery. The drone also has a series of legs that are even in length and they are used primarily for takeoff and landing use. These legs come with flat stoppers on the bottom. This serves to help keep the drone on the ground before it takes off. The XK Detect X380 comes with a black and white body. There are also a few red accents that are included to help distinguish where the individual propellers are to go. Also, the design of the drone keeps the four rotors far apart from each other. These rotors are of the same distance from each other and are also of the same weight, which ensures that the flight pattern will be balanced and even. The XK Detect X380 uses an 11.1V 5400mAh 20C Li-Po battery, which is light in weight and will generate enough power to the drone in order to properly stay in the air. It is important to note that the battery can be removed from the drone if needed. When there is no camera added onto the drone, it works with a flight time of around 25 to 30 minutes. When a camera is mounted onto its body, the flight time may be reduced to about 20 minutes. The battery takes about 90 to 120 minutes to completely charge. This is solid flight time but if you are looking for drones that have longest flight time, this list is for you. You could also purchase a second battery and add that in to get the drone running because the plugs used to link to the main body are easy to connect and will lock the battery into place. Also, you could use a stronger battery to extend the drone’s flight time. The XK Detect X380 does not come with a built-in camera. However, it is compatible with a number of small HD cameras like the GoPro series. These cameras can easily be attached to the drone’s main body via a camera holder. These drones are top drones for GoPro camera – check them out. A camera holder is included at the bottom part of the drone, which allows you to mount a camera onto the aircraft. The transmitter will not control the camera’s features while in the air so you will have to get the camera to start up before the X380 takes off. Also, before you get the drone to take off, you must adjust the zoom feature on the camera. Luckily, the movement of the drone should keep the camera in its place while in the air, and less likely to shift or move around. The flight controller used by the XK Detect X380 is a mode 2 transmitter, which means that the throttle is on the left part of the transmitter. The controller is quite large and has a pretty professional look and runs on a 2.4GHz frequency. The 6 channel remote controller also features a great control range (1000 meters). The controller features professional all-black look, and it also feels good in your hands too. The buttons are placed ergonomically and there are also dedicated switches for “headless” mode and return-to-launch (“Go Home”). A return home button is on the top right of the transmitter and it will bring the drone back closer to the transmitter. There is also a button for toggling between stick modes and another button for automatic take off and landing. A takeoff and landing button allows the XK Detect X380 to get its balance as it lands on a flat surface and it also assists in keeping the drone from taking off in an uneven manner. There is also a radial dial button, which is located on the right side near the LCD display. This button allows to fine tune the gimbal’s position. It is important to note that, regardless the fact that a 2D or 3D gimbal is installed, only one axis can be controlled through the transmitter. An LCD screen displays important information like throttle position, battery level and other status details and dominates the lower part of the transmitter. The transmitter offers an elevator and aileron control on the right and a throttle and direction control on the left. Power is supplied by six 1.5V AA batteries and these can be easily installed into the back of the transmitter. The XK Detect X380 is designed to capture amazing photos and videos from the air. The X380 is not a drone you’d purchase for the thrill of flying, racing or performing aerial stunts and it is tuned and designed purely for aerial photography. A GPS device is used inside the drone. This feature allows the drone to easily identify where it starts up, which allows it to move back to its starting point. Thanks to how its rotors are evenly balanced, the X380 flies with such stability and grace that you’d think it’s a $1,000 drone. The legs on the drone allow you to place it on a flat surface so you can get it to take off and they can also quickly get the quad to land onto a flat surface. The Detect X380 can be flown up to 1,000 meters (3280 feet) away from you. 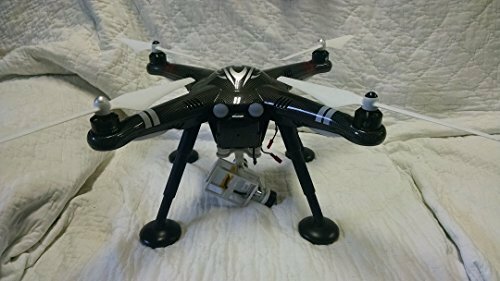 This drone is very easy to pilot in a variety of spaces and it flies quite well. You will definitely enjoy flying this drone with a camera that can be added onto its body. The remote controller works well from a long distance and is very responsive. The 2212 950KV brushless motors do not generate a great amount of friction and they operate effortlessly. The camera is easy to use because the housing features used to keep a camera intact are sturdy enough. The charging functions are easy to use and you can work with either a USB charger or the wall charger to get this drone powered up. XK originally priced this drone at about $560. However, today the XK Detect X380 quadcopter is available for close to $300 depending on where you go. The mounting items are also included on the drone’s body. This means that you can always use the base to link up such a camera to it. It will cost extra for you to get an HD camera to be attached at the bottom of the drone, but luckily a GoPro HD camera, in its lowest forms, can be bought for a little more than $100. As far as guarantee goes, you will have to check with the seller, because the manufacturer has not listed any information regarding any guarantees or warranties. In this video I'm going to test a drone (Detect x380). Epidemic Sound: http://www.epidemicsound.com. The XK Detect X380 is an impressive drone that can be suitable for a variety of fun things to do with a drone and the excitement that comes with flying this drone certainly deserves to be explored. The XK DETECT X380 is a beginner and aerial filming oriented drone and it is a popular choice for its strong body and the fact that is easy to pilot. The drone also features extremely good control range and flight time. You can always use this drone in a variety of outdoor settings and you can even add a camera to capture high-quality pictures and videos.